In a bowl place the eggs, oil and milk. Mix them with a whisk. You will use this mixture for every two or three layers of the pastry and on top. Grease the Pyrex dish. Take 2-3 layers of sheets place them on the counter. Spread three tbsps of the mixture on it and put some of the filling (available in Turkish Borek Recipe) you are using and spread it evenly. Wrap it around loosely, do not make it tight. Start whirling the wrapped pastries from the center of the Pyrex. Continue spreading 3 tbsps of mixture and filling. Then, wrap and continue whirling from the end of the last one. Repeat the same procedure till the pastry sheets finish. Preheat the oven to 350 F (175 C) and cook for about 45 minutes, until it turns golden brown. Bir kasede yumurta, sivi yag ve sutu cirpin. 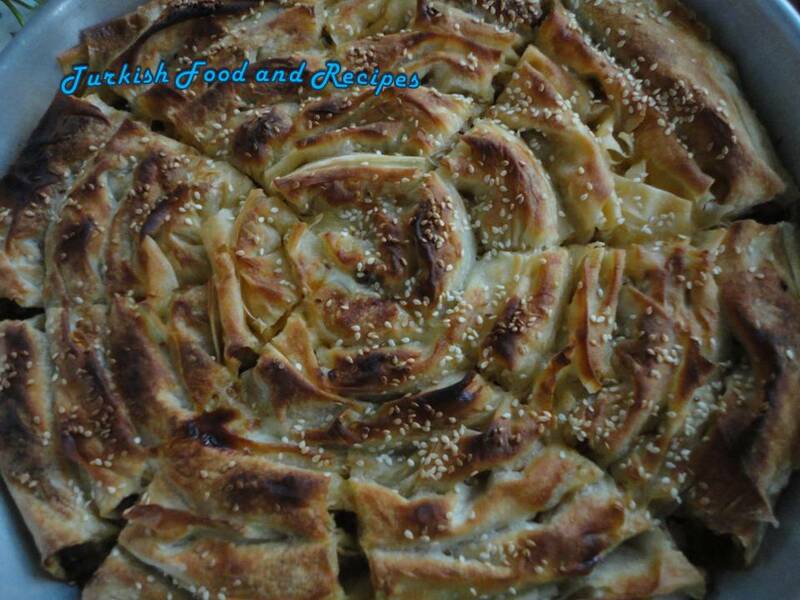 Bu karisimi her 2-3 tabaka phillo pastry / 1yufka icin ve boregin uzeri icin kullanacaksiniz. Tepsiyi yaglayin. 2-3 tabaka phillo pastry/ 1 tane yufka alip tezgaha yayin, uzerine 3 yemek kasigi sut karisiminda koyup, esit olarak yaymaya calisin. Kullanacaginiz ic malzemeden (Borek Tarifinde gorebilirsiniz) bir miktar koyup yayin.Yufkanin bir kenarindan tutup rulo seklinde gevsek sekilde sarin. Tepsinin merkezinden itibaren rulo yaptiginiz yufkayi dolayarak ortaya yerlestirin. Bu islemi geride kalan yufkalar icin tekrarlamaya devam edin. Rulolari tepsinin ortasindan kenarina dogru dolayarak yerlestirmeye devam edin. Geriye kalan sutlu karisimi boregin uzerine esit olarak yayin ve susam, corek otu (istege bagli) ile susleyin. Onceden isitilmis 175 C (350 F) firinda uzeri kizarana dek, yaklasik 45 dakika pisirin. I love this site. The idea of both languages is great. Thanks and keep up the great work!